Pareta Farms is a third generation professional farming and grazing business that is located near Freeling in the lower north of South Australia. Provide farm operations and farm land management services for landholders/investors via leasing, share farming and contract farming arrangements. Provide a safe and enjoyable workplace for team members. 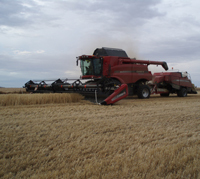 Grow grain, hay and straw using sustainable farming practices. Manage livestock according to high animal welfare standards. Demonstrate a professional approach to agricultural, property and business management. Be innovative in farm management and crop/livestock production. Communicate and work collaboratively with landholders and investors. Pareta Farms manages 800 hectares and is spread across three properties on the western side of the Barosssa Valley. There is 35 kilometres from the southern most paddock to the northern most paddock.